Directive 2004/23/EC lays down standards of quality and safety for the donation, procurement, testing, processing, preservation, storage and distribution of human tissues and cells intended for human applications, and of manufactured products derived from human tissues and cells intended for human applications, so as to ensure a high level of human health protection. In order to prevent the transmission of diseases by human tissues and cells for human applications and to ensure an equivalent level of quality and safety, Directive 2004/23/EC calls for the establishment of specific technical requirements for each one of the steps in the human tissues and cells application process, including standards and specifications with regard to a quality system for tissue establishments. An accreditation, designation, authorisation or licensing system for tissue establishments and for the preparation processes at the tissue establishments should be established in Member States in accordance with Directive 2004/23/EC, in order to ensure a high level of protection of human health. It is necessary to lay down the technical requirements for this system. The requirements for accreditation, designation, authorisation or licensing of tissue establishments should cover the organisation and management, personnel, equipment and materials, facilities/premises, documentation and records and quality review. Accredited, designated, authorised or licensed tissue establishments should comply with additional requirements for the specific activities they carry out. The air quality standard during the processing of tissues and cells is a key factor that may influence the risk of tissue or cell contamination. An air quality with particle counts and microbial colony counts equivalent to those of Grade A, as defined in the European Guide to Good Manufacturing Practice, Annex 1 and Commission Directive 2003/94/EC (2), is generally required. However, in certain situations, an air quality with particle counts and microbial colony counts equivalent to those of Grade A standard is not indicated. In these circumstances it should be demonstrated and documented that the chosen environment achieves the quality and safety required for the type of tissue and cells, process and human application concerned. The scope of this Directive should embrace the quality and safety of human tissues and cells during coding, processing, preservation, storage and distribution to the healthcare establishment where they will be applied to the human body. However, it should not extend to the human application of these tissues and cells (such as implantation surgery, perfusion, insemination or transfer of embryos). The provisions of this Directive concerning traceability and the reporting of serious adverse reactions and events apply also to the donation, procurement and testing of human tissues and cells regulated by Commission Directive 2006/17/EC (3). The use of tissues and cells for human application carries a risk of disease transmission and other potential adverse effects in recipients. In order to monitor and reduce these effects, specific requirements for traceability and a Community procedure for notifying serious adverse reactions and events should be set out. 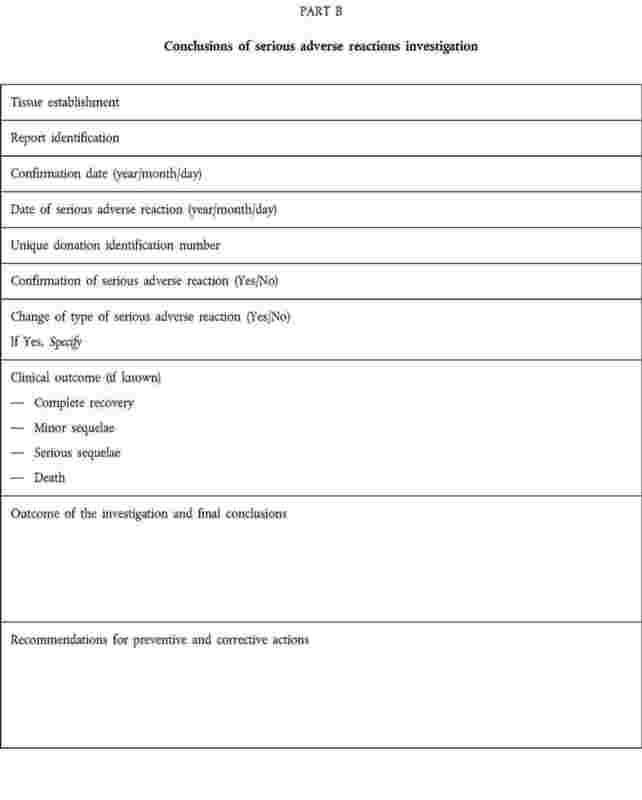 Suspected serious adverse reactions, in the donor or in the recipient, and serious adverse events from donation to distribution of tissues and cells, which may influence the quality and safety of tissues and cells and which may be attributed to procurement (including donor evaluation and selection), testing, processing, preservation, storage and distribution of human tissues and cells should be notified without delay to the competent authority. Serious adverse reactions may be detected during or following procurement in living donors or during or following human application. They should be reported to the associated tissue establishment for subsequent investigation and notification to the competent authority. This should not preclude a procurement organisation or an organisation responsible for human application from also directly notifying the competent authority if it so wishes. This Directive should define the minimum data needed for notification to the competent authority, without prejudice to the ability of Member States to maintain or introduce in their territory more stringent and protective measures which comply with the requirements of the Treaty. In order to minimise transmission costs, avoid overlaps and increase administrative efficiency, modern technologies and e-government solutions should be used to perform the tasks related to the transmission and treatment of information. These technologies should be based on a standard exchange format using a system suitable for the management of reference data. To facilitate traceability and information on the main characteristics and properties of tissues and cells, it is necessary to lay down the basic data to be included in a single European code. manufactured products derived from human tissues and cells intended for human applications, where those products are not covered by other directives. 2. The provisions of Articles 5 to 9 of this Directive, concerning traceability and the reporting of serious adverse reactions and events shall also apply to the donation, procurement and testing of human tissues and cells. ‘organisations responsible for human application’ means a health care establishment or a unit of a hospital or another body which carries out human application of human tissues and cells. A tissue establishment must comply with the requirements set out in Annex I. Preparation processes at the tissue establishments must comply with the requirements set out in Annex II. tissue establishments that distribute tissue and cells for human application provide information to the organisation responsible for human application of tissues and cells about how that organisation should report serious adverse reactions as referred to in (b). have procedures in place to communicate to the competent authority without delay the conclusion of the investigation to analyse the cause and the ensuing outcome. tissue establishments notify the competent authority of the conclusion of the investigation, supplying at least the information set out in Part B of Annex III. tissue establishments provide to the organisation responsible for human application information about how that organisation should report serious adverse events to them that may influence the quality and safety of the tissues and cells. 2. In the case of assisted reproduction, any type of gamete or embryo misidentification or mix-up shall be considered to be a serious adverse event. All persons or procurement organisations or organisations responsible for human application performing assisted reproduction shall report such events to the supplying tissue establishments for investigation and notification to the competent authority. tissue establishments notify the competent authority of the conclusion of the investigation, supplying at least the information set out in Part B of Annex IV. 1. 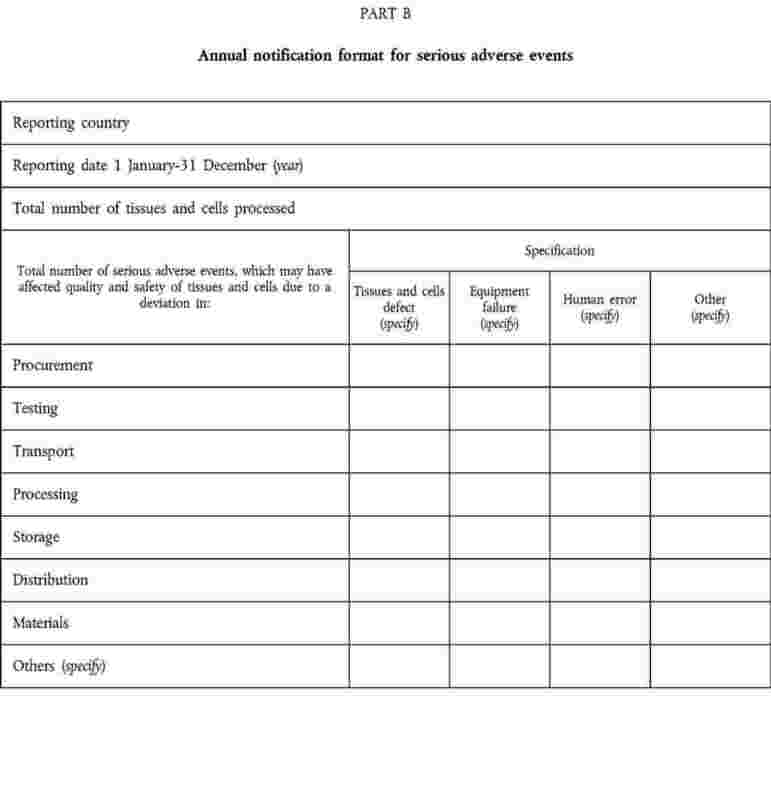 Member States shall submit to the Commission an annual report, by 30 June of the following year, on the notification of serious adverse reactions and events received by the competent authority. The Commission shall submit to the competent authorities of Member States a summary of the reports received. The competent authority shall make this report available to tissue establishments. 2. Data transmission shall comply with the data exchange format specifications as set out in Annex V, part A and B, and shall provide all the information necessary to identify the sender and maintain its reference data. Member States shall ensure that their competent authorities communicate to each other and to the Commission such information as is appropriate with regard to serious adverse reactions and events, in order to guarantee that adequate actions are taken. 1. Tissue establishments shall have effective and accurate systems to uniquely identify and label cells/tissues received and distributed. 2. Tissue establishments and organisations responsible for human application shall retain the data set out in Annex VI for at least 30 years, in an appropriate and readable storage medium. 1. A single European identifying code shall be allocated to all donated material at the tissue establishment, to ensure proper identification of the donor and the traceability of all donated material and to provide information on the main characteristics and properties of tissues and cells. The code shall incorporate at least the information set out in Annex VII. 2. Paragraph 1 shall not apply to partner donation of reproductive cells. 1. Member States shall bring into force the laws, regulations and administrative provisions necessary to comply with this Directive by 1 September 2007, at the latest. They shall forthwith communicate to the Commission the text of those provisions and a correlation table between those provisions and this Directive. Member States shall bring into force the laws, regulations and administrative provisions necessary to comply with Article 10 of this Directive, by 1 September 2008. Done at Brussels, 24 October 2006. (2) http://pharmacos.eudra.org/F2/eudralex/vol-4/home.htm and OJ L 262, 14.10.2003, p. 22. (3) OJ L 38, 9.2.2006, p. 40. A responsible person must be appointed having qualifications and responsibilities as provided in Article 17 of Directive 2004/23/EC. A tissue establishment must have an organisational structure and operational procedures appropriate to the activities for which accreditation/designation/authorisation/licensing is sought; there must be an organisational chart which clearly defines accountability and reporting relationships. Every tissue establishment must have access to a nominated medical registered practitioner to advise on and oversee the establishment’s medical activities such as donor selection, review of clinical outcomes of applied tissues and cells or interaction as appropriate with clinical users. There must be a documented quality management system applied to the activities for which accreditation/designation/authorisation or licensing is sought, in accordance with the standards laid down in this Directive. It must be ensured that the risks inherent in the use and handling of biological material are identified and minimised, consistent with maintaining adequate quality and safety for the intended purpose of the tissues and cells. The risks include those relating in particular to the procedures, environment, staff health status specific to the tissue establishment. Agreements between tissue establishments and third parties must comply with Article 24 of Directive 2004/23/EC. Third party agreements must specify the terms of the relationship and responsibilities as well as the protocols to be followed to meet the required performance specification. There must be a documented system in place, supervised by the responsible person, for ratifying that tissues and/or cells meet appropriate specifications for safety and quality for release and for their distribution. In the event of termination of activities the agreements concluded and the procedures adopted in accordance with Article 21(5) of Directive 2004/23/EC shall include traceability data and material concerning the quality and safety of cells and tissues. There must be a documented system in place that ensures the identification of every unit of tissue or cells at all stages of the activities for which accreditation/designation/authorisation/licensing is sought. The personnel in tissue establishments must be available in sufficient number and be qualified for the tasks they perform. The competency of the personnel must be evaluated at appropriate intervals specified in the quality system. All personnel should have clear, documented and up-to-date job descriptions. Their tasks, responsibilities and accountability must be clearly documented and understood. is adequately informed of the broader ethical, legal and regulatory context of their work. All equipment and material must be designed and maintained to suit its intended purpose and must minimise any hazard to recipients and/or staff. All critical equipment and technical devices must be identified and validated, regularly inspected and preventively maintained in accordance with the manufacturers' instructions. Where equipment or materials affect critical processing or storage parameters (e.g. temperature, pressure, particle counts, microbial contamination levels), they must be identified and must be the subject of appropriate monitoring, alerts, alarms and corrective action, as required, to detect malfunctions and defects and to ensure that the critical parameters are maintained within acceptable limits at all times. All equipment with a critical measuring function must be calibrated against a traceable standard if available. New and repaired equipment must be tested when installed and must be validated before use. Test results must be documented. Maintenance, servicing, cleaning, disinfection and sanitation of all critical equipment must be performed regularly and recorded accordingly. Procedures for the operation of each piece of critical equipment, detailing the action to be taken in the event of malfunctions or failure, must be available. The procedures for the activities for which accreditation/designation/authorisation/licensing is sought, must detail the specifications for all critical materials and reagents. In particular, specifications for additives (e.g. solutions) and packaging materials must be defined. Critical reagents and materials must meet documented requirements and specifications and when applicable the requirements of Council Directive 93/42/EEC of 14 June 1993 concerning medical devices (1) and Directive 98/79/EC of the European Parliament and of the Council of 27 October 1998 on in vitro diagnostic medical devices (2). A tissue establishment must have suitable facilities to carry out the activities for which accreditation/designation/authorisation or licensing is sought, in accordance with the standards laid down in this Directive. When these activities include processing of tissues and cells while exposed to the environment, this must take place in an environment with specified air quality and cleanliness in order to minimise the risk of contamination, including cross-contamination between donations. The effectiveness of these measures must be validated and monitored. Unless otherwise specified in point 4, where tissues or cells are exposed to the environment during processing, without a subsequent microbial inactivation process, an air quality with particle counts and microbial colony counts equivalent to those of Grade A as defined in the current European Guide to Good Manufacturing Practice (GMP), Annex 1 and Directive 2003/94/EC is required with a background environment appropriate for the processing of the tissue/cell concerned but at least equivalent to GMP Grade D in terms of particles and microbial counts. or, where it is not technically possible to carry out the required process in a Grade A environment (for example, due to requirements for specific equipment in the processing area that is not fully compatible with Grade A). In point 4(a), (b), (c) and (d), an environment must be specified. It must be demonstrated and documented that the chosen environment achieves the quality and safety required, at least taking into account the intended purpose, mode of application and immune status of the recipient. Appropriate garments and equipment for personal protection and hygiene must be provided in each relevant department of the tissue establishment along with written hygiene and gowning instructions. When the activities for which accreditation/designation/authorisation or licensing is sought involve storage of tissues and cells, the storage conditions necessary to maintain the required tissue and cell properties, including relevant parameters such as temperature, humidity or air quality must be defined. Critical parameters (e.g. temperature, humidity, air quality) must be controlled, monitored, and recorded to demonstrate compliance with the specified storage conditions. Storage facilities must be provided that clearly separate and distinguish tissues and cells prior to release/in quarantine from those that are released and from those that are rejected, in order to prevent mix-up and cross-contamination between them. Physically separate areas or storage devices or secured segregation within the device must be allocated in both quarantine and released storage locations for holding certain tissue and cells collected in compliance with special criteria. The tissue establishment must have written policies and procedures for controlled access, cleaning and maintenance, waste disposal and for the re-provision of services in an emergency situation. There must be a system in place that results in clearly defined and effective documentation, correct records and registers and authorised Standard Operating Procedures (SOPs), for the activities for which accreditation/designation/authorisation/licensing is sought. Documents must be regularly reviewed and must conform to the standards laid down in this Directive. The system must ensure that work performed is standardised, and that all steps are traceable; i.e. coding, donor eligibility, procurement, processing, preservation, storage, transport, distribution or disposal, including aspects relating to quality control and quality assurance. For every critical activity, the materials, equipment and personnel involved must be identified and documented. In the tissue establishments all changes to documents must be reviewed, dated, approved, documented and implemented promptly by authorised personnel. A document control procedure must be established to provide for the history of document reviews and changes and to ensure that only current versions of documents are in use. Records must be shown to be reliable and a true representation of the results. Records must be legible and indelible and may be handwritten or transferred to another validated system, such as a computer or microfilm. Without prejudice to Article 9(2), all records, including raw data, which are critical to the safety and quality of the tissues and cells shall be kept so as to ensure access to these data for at least 10 years after expiry date, clinical use or disposal. Records must meet the confidentiality requirements laid down in Article 14 of Directive 2004/23/EC. Access to registers and data must be restricted to persons authorised by the responsible person, and to the competent authority for the purpose of inspection and control measures. An audit system must be in place for the activities for which accreditation/designation/authorisation/licensing is sought. Trained and competent persons must conduct the audit in an independent way, at least every two years, in order to verify compliance with the approved protocols and the regulatory requirements. Findings and corrective actions must be documented. Deviations from the required standards of quality and safety must lead to documented investigations, which include a decision on possible corrective and preventive actions. The fate of non-conforming tissues and cells must be decided in accordance with written procedures supervised by the responsible person and recorded. All affected tissues and cells must be identified and accounted for. Corrective actions must be documented, initiated and completed in a timely and effective manner. Preventive and corrective actions should be assessed for effectiveness after implementation. The tissue establishment should have processes in place for review of the performance of the quality management system to ensure continuous and systematic improvement. (2) OJ L 331, 7.12.1998, p. 1. Directive as amended by Regulation (EC) No 1882/2003. The competent authority shall authorise each tissue and cell preparation process after evaluation of the donor selection criteria and procurement procedures, the protocols for each step of the process, the quality management criteria, and the final quantitative and qualitative criteria for cells and tissues. This evaluation must comply at least with the requirements set out in this Annex. Upon reception of procured tissues and cells at the tissue establishment, the tissues and cells must comply with the requirements defined in Directive 2006/17/EC. The critical processing procedures must be validated and must not render the tissues or cells clinically ineffective or harmful to the recipient. This validation may be based on studies performed by the establishment itself, or on data from published studies or, for well established processing procedures, by retrospective evaluation of the clinical results for tissues supplied by the establishment. It has to be demonstrated that the validated process can be carried out consistently and effectively in the tissue establishment environment by the staff. The procedures must be documented in SOPs which must conform to the validated method and to the standards laid down in this Directive, accordingly with Annex I(E), points 1 to 4. It must be ensured that all processes are conducted in accordance with the approved SOPs. Where a microbial inactivation procedure is applied to the tissue or cells, it must be specified, documented, and validated. Before implementing any significant change in processing, the modified process must be validated and documented. The processing procedures must undergo regular critical evaluation to ensure that they continue to achieve the intended results. Procedures for discarding tissue and cells must prevent the contamination of other donations and products, the processing environment or personnel. These procedures must comply with national regulations. Maximum storage time must be specified for each type of storage condition. The selected period must reflect among others possible deterioration of the required tissue and cell properties. There must be a system of inventory hold for tissues and/or cells to ensure that they cannot be released until all requirements laid down in this Directive have been satisfied. There must be a standard operating procedure that details the circumstances, responsibilities and procedures for the release of tissues and cells for distribution. A system for identification of tissues and cells throughout any phase of processing in the tissue establishment must clearly distinguish released from non-released (quarantined) and discarded products. Records must demonstrate that before tissues and cells are released all appropriate specifications are met, in particular all current declaration forms, relevant medical records, processing records and test results have been verified according to a written procedure by a person authorised for this task by the responsible person as specified in Article 17 of Directive 2004/23/EC. If a computer is used to release results from the laboratory, an audit trail should indicate who was responsible for their release. 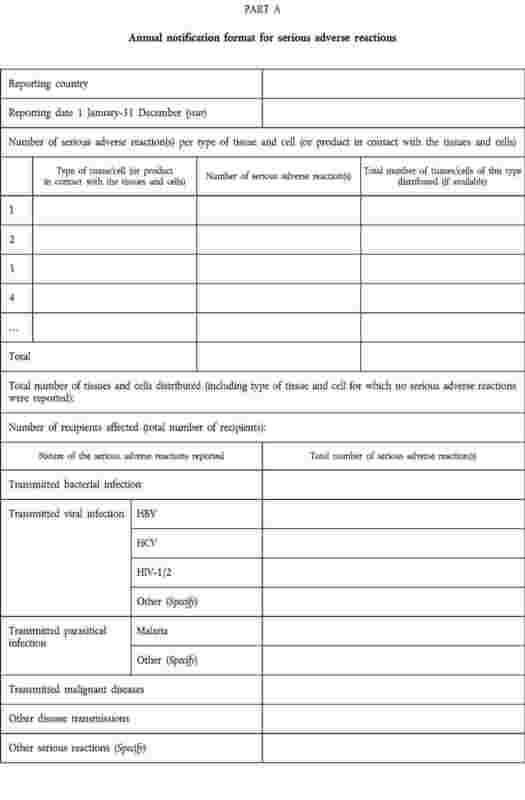 A documented risk assessment approved by the responsible person as defined in Article 17 of Directive 2004/23/EC must be undertaken to determine the fate of all stored tissues and cells following the introduction of any new donor selection or testing criterion or any significantly modified processing step that enhances safety or quality. Critical transport conditions, such as temperature and time limit must be defined to maintain the required tissue and cell properties. The container/package must be secure and ensure that the tissue and cells are maintained in the specified conditions. All containers and packages need to be validated as fit for purpose. Where distribution is carried out by a contracted third party, a documented agreement must be in place to ensure that the required conditions are maintained. There must be personnel authorised within the tissue establishment to assess the need for recall and to initiate and coordinate the necessary actions. An effective recall procedure must be in place, including a description of the responsibilities and actions to be taken. This must include notification to the competent authority. Actions must be taken within pre-defined periods of time and must include tracing all relevant tissues and cells and, where applicable, must include trace-back. The purpose of the investigation is to identify any donor who might have contributed to causing the reaction in the recipient and to retrieve available tissues and cells from that donor, as well as to notify consignees and recipients of tissues and cells procured from the same donor in the event that they might have been put at risk. Procedures must be in place for the handling of requests for tissues and cells. The rules for allocation of tissues and cells to certain patients or health care institutions must be documented and made available to these parties upon request. A documented system must be in place for the handling of returned products including criteria for their acceptance into the inventory, if applicable. when tissues and cells are known to be positive for a relevant infectious disease marker, it must be marked as: BIOLOGICAL HAZARD. If any of the information under points (d) and (e) above cannot be included on the primary container label, it must be provided on a separate sheet accompanying the primary container. This sheet must be packaged with the primary container in a manner that ensures that they remain together. presence of potential harmful residues (e.g. antibiotics, ethylene oxide etc). safety instructions/method of cooling (when applicable). Description and origin of the products, processing steps applied, materials and additives coming into contact with tissues and cells and having an effect on their quality and/or safety.